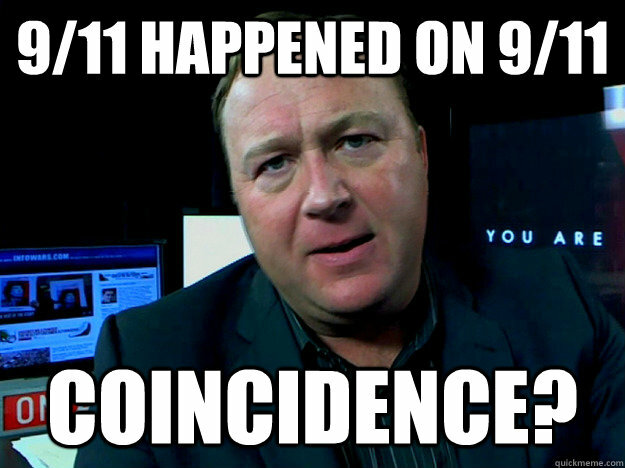 (b) that giant microwave/ laser beams destroyed the twin towers and created the dust. I leaned towards that view before I understood what Dan's view was. Out of a set of implausible alternatives presented by various academics which are represented within the three general theories, some kind of directed energy process is the most convincing in light of the scale of destruction and the surrounding evidence. We can certainly discount the official narrative as something that can only believed by simpletons. But beyond that certitude as I've made clear before I don't fully know. elevations of the structure. Except for some selected floors, for which normal strength concrete was employed, the composite slabs were made of a 21MPa (3ksi) lightweight concrete. Fire resistance of the perimeter columns was provided by a layer of sprayed concrete around the three sides of each column. The concrete layer had a thickness of about 5cm and included ceramic fibers in the mix. The interior face of each column was fire protected with approximately 5cm thick layer of vermiculate plaster (Figure16). Various structural ideas are discussed for the collapse. It would be interesting to hear the counter to these theories. Tacoma Narrows Bridge, 7 November 1940. And I'm no structural engineer. The problem with that is, that if we look at the debris, there does not appear to be beams that bent at the same type of angles as happened in the WTC collapse. Some of the I-beams in that are contorted and bent in very sharp angles. The bridge is not a satisfactory comparison for this problem. Seeing as the floors included a covering of less dense concrete, it is understandable how this might account for a large amount of the near instantaneous airborne pulverised material. However would it account for the quantity that was pulverised, it is alleged millions of tons was pulverised into dust, with in some places around Manhattan half foot deep settling. Would merely those concrete floors and concrete fire coatings account for this? Another issue that occurred to me, is with the higher floors - When the energy was lower and energy accumulation due to mass and gravity might account for a pounding and grinding of floors yet to be collapsed, how were the very first few floors pulverised into dust. BUT even more problematic is, if those floors were pulverised and as can be seen from the footage are directed in vectors no longer downward onto the uncollapsed building floors, but outward and in trajectories away from or tangental or even parallel to the remaining uncollapsed floors - then the already first few pulverised floors and each new consecutive pulverised floor were not part of a more concerted concentrated dense mass which would have added destructive impulse to the destructive collapsing momentous mass, i.e the factor of mass in the destructive downward momentum would have been less at each stage then the expected accumulative mass for each stage, as the pulverised masses are being lost to the destructive system. Also if there is a loss in the mass component in the destructive momentum energy then any gains in the velocity component due to acceleration due to gravity would merely mean a zero sum gain in momentum and therefore in the destructive energy of the system, thus at some point in the collapse, the collapse would come to a stop, leaving the remaining part of the structure still standing. The following article states it was not only concrete that was pulverised, but steel, glass, as well as human bodies. Now I can accept human bodies being torn to shreds...i.e very small pieces, which would however still be identifiable, but not pulverised into dust merely due to steel and concrete collapsing on them. To pulverise steel and human bodies into dust would mean explosives. "The collapse of the Twin Towers pulverized and then scattered into the air millions of tons of cement, steel, drywall, window glass and other building materials. It also crushed and incinerated thousands of computers as well as mile after mile of items such as electrical cable and heating and cooling ducts. 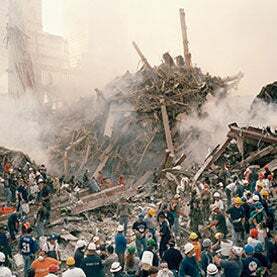 Finally, the dust contained the remains of the 2,753 people killed in the attack, along with the hair and skin cells shed by those who worked in the World Trade Center over the decades. " 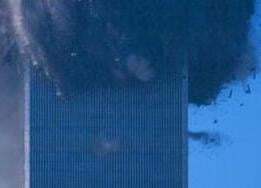 Some idea of the volume of the dust clouds can be obtained by examining photographs taken shortly after each tower collapsed. The researcher calling himself plaguepuppy articulated the thoroughness of the destruction and its incompatibility with the official explanation. In trying to come to terms with what actually happened during the collapse of the World Trade Towers, the biggest and most obvious problem that I see is the source of the enormous amount of very fine dust that was generated during the collapses. Even early on, when the tops of the buildings have barely started to move, we see this characteristic fine dust (mixed with larger chunks of debris) being shot out very energetically from the building. During the first few seconds of a gravitational fall nothing is moving very fast, and yet from the outset what appears to be powdered concrete can be seem blowing out to the sides, growing to an immense dust cloud as the collapse progresses. The floors themselves are quite robust. Each one is 39" thick; the top 4" is a poured concrete slab, with interlocking vertical steel trusses (or spandrel members) underneath. This steel would absorb a lot of kinetic energy by crumpling as one floor fell onto another, at most pulverizing a small amount of concrete where the narrow edges of the trusses strike the floor below. And yet we see a very fine dust being blown very energetically out to the sides as if the entire mass of concrete (about 400,000 cubic yards for the whole building) were being converted to dust. Remember too that the tower fell at almost the speed of a gravitational free-fall, meaning that little energy was expended doing anything other than accelerating the floor slabs." FAQ #3: What caused the isolated high-speed ejections of pulverized dust and debris from the Twin Towers? Pulverised bodies are a particular problem for the uncontrolled collapse position. No bodies or large parts of bodies, only tiny extremely small fragments and bone fragments were found. Do you believe planes can be remotely flown? No I do not ‘believe’. I accept it as a obvious matter of fact. Yes of course. Reasonace is an issue that must be taken into account for all large engineering problems.....bridges, aircraft, buildings. But you are claiming that resonance at an atomic level via some directed energy weapon could have destroyed the WTCs. Yeah, but only with vast amounts of energy. It’s a completely different phenomena. Bridge collapse etc is due to reasonance acting on a large scale when the natural frequency of a large structure such as a bridge coincides with the frequency of the force caused by an external factor such as aerodynmamic force caused by wind. How is that applicable to an directed energy weapon working against atoms?